When asked to say a few words about Reporters, Justin Roiland replied, "It's a modern tale and struggle of... uhm... I dunno. A fantastic epic following the struggles of two well-meaning newspaper reporters and their out-of-the-ordinary boss." He then left the room and returned moments later to add: "A.K.A. a slapdash turd of a Channel 101 show." This insane attempt from Roiland, Vatche Panos, and Kelsy Abbott charmed audiences just enough in January of 2007 to fill the Prime Time void left by the Phone Sexxers self-cancellation. Even later, Justin returned to add that "Reporters is the only Channel 101 show that has AIDS. You should put that." A wild shoot out at the newspaper offices, causes The Reporters to question the Chief's motives. All they want to do is write newspaper articles and be legitimate reporters, but instead Chief Wilcocks sends them to Zordon to retrieve a mysterious package. 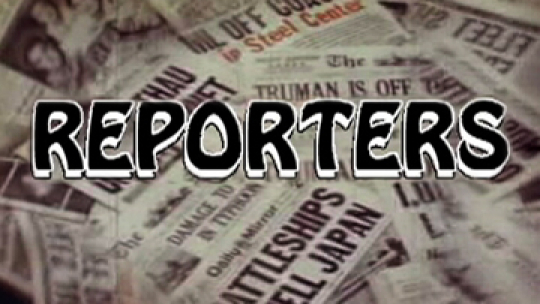 A newspaper reporter and a newspaper photographer must cover a story about a leaky faucet.